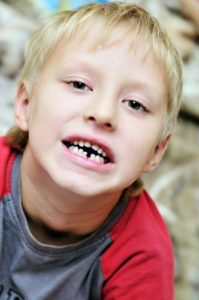 Accidents involving the teeth and face are common among children. Children have the tendency to be active while growing up as they haven’t fully developed their motor skills and coordination making accidents unavoidable at times. The most common age that children have teeth injury is between the ages of 2- 5 years. When they get older your child may have sporting and other accidents which can cause teeth damage, but as for young kids they usually end up damaging their teeth while playing innocent games with friends and siblings. Depending on the accident kids have, the outcomes can be displaced, broken or even knocked out tooth. Let’s look at some of the steps you can take to improve the long term survival of your tooth when it has been damaged. As a parent or guardian, the first thing you should do if your kid hurts his face, affecting his or her teeth is to go see a professional. You want to make sure that your child hasn’t suffered any long lasting teeth injuries that can’t be repaired. Your child’s well-being should be your number one concern. A dentist will be able to evaluate your child’s injuries and recommend the best possible action that will provide your child with full recovery. Whether you break, chip or knock your teeth your dentist will be able to let you know which method to select as each patient comes in with different circumstances and needs. If your child is involved in an accident that displays a loose or displaced tooth then you shouldn’t try meddling with it and should see your dentist for treatment. This is important as the dentist may decide to leave the tooth in place or extract it depending on the condition of the tooth. In some cases, a tooth may be displaced to the point that it gets locked into a different position in the bone. Regardless, you need to avoid damaging your child’s tooth so rather than taking things in your own hand make a trip to the dentist to ensure all necessary steps are taken to treat the tooth properly. Your child can have a severe accident involving a knocked out tooth. When a child has a knocked tooth it’s important to take him to the dentist and see if the tooth can be placed back into the mouth. Parents should avoid touching the root of the tooth and rinsing or washing it. When a tooth gets knocked out it’s not only about the tooth, it’s also about the damage done to the gums. You need to make sure no bacteria and bleeding have been formed within the gum as that may cause long term infections. While growing up, your child will have accidents that can have an impact on his body and teeth. As a parent, you want to ensure your child doesn’t get involved in such accidents, but sometimes things just happen as it’s a part of growing up. You need to make sure the necessary steps are taken so your child’s health and broken teeth are well taken care of.